"This is what I've found to be the optimal way for cooking perfectly crispy bacon in the air fryer." Preheat an air fryer to 390 degrees F (200 degrees C). 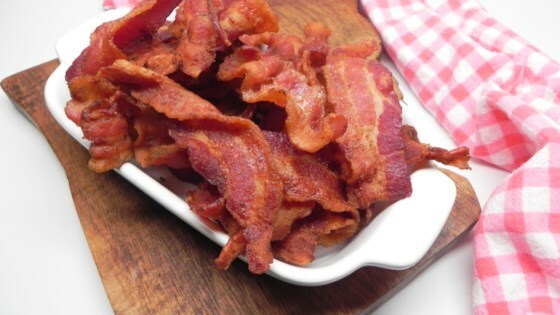 Lay bacon on a single layer inside the air fryer basket; it's ok if there is some overlapping or folding. Cook for 8 minutes. Flip the bacon and cook until bacon is crisp, about 7 minutes more. Transfer cooked bacon to a plate lined with paper towels to soak up excess grease.